Three channels each with a capacity of 4 Amps. Signal protocol DMX 512/1990 and dimming levels 256. With the option of XLR 3pin or RJ45 connection. This module comes with over load protection with automatic switch off. 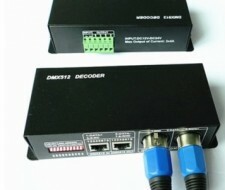 The power capacity is 144W for 12Vdc products and 288W for 24Vdc products. Requires a competent person to install.